Publics around the world express concern about levels of immigration to their country. Majorities in 44 of the 47 countries surveyed agree with the statement “We should restrict and control entry of people into our country more than we do now.” At the same time, solid majorities of Americans and Canadians say it is a good thing that Asians, Mexicans, and Latin Americans come to live and work in their countries, and majorities in Britain and France express this opinion about Middle Eastern, North African, and Eastern European immigrants. Publics in Germany, Spain, and Israel express more negative views of immigrants to their countries. When asked why people leave their country to live in another country, solid majorities in every Latin American, Eastern European, and African country surveyed, as well as in several Middle Eastern and Asian countries, say it is for job opportunities. This opinion is nearly unanimous in Senegal, Bolivia, Poland, Morocco, Bangladesh, Peru, Ivory Coast, Brazil, Slovakia, and Mali, where more than nine-in-ten say jobs are the main reason people emigrate. The survey also finds that more than one-in-five in eleven countries, including nearly half in Lebanon (47%) and Bangladesh (45%), say they receive money from relatives living in another country. Support for tighter border control is high both in the affluent countries of the West and in the developing world. With the exception of Japan, South Korea and the Palestinian territories, majorities in every country polled say their countries should restrict immigration more than they do now. This view is particularly widespread in Africa, where at least three-quarters in seven of the countries surveyed agree that the entry of people into their country should be more restricted, and in southern Asian countries. More than nine-in-ten in Ivory Coast (94%) and almost as many in South Africa, Indonesia and Malaysia (89% each) agree. Majorities of Americans and Canadians also say that there should be more restrictions on people entering their countries than there is today. Three-quarters of Americans and 62% of Canadians express that opinion. These concerns are shared by Latin American publics as well. About three quarters of Venezuelans (77%), Chileans (74%) and Bolivians (73%) agree that their countries should restrict and control immigration more than they do today, as do solid majorities of Brazilians (72%), Mexicans (71%) and Argentines (68%) and just slightly more than half of Peruvians (51%). This sentiment is shared by more than seven-in-ten in Spain (77%), Britain (75%), the Czech Republic (75%) and Russia (72%), and more than six-in-ten in France (68%), Germany (66%), Slovakia (64%) and Ukraine (63%). Narrow majorities in Sweden, Bulgaria and Poland (53% each) also agree that there should be more restrictions on immigration to their country. Publics in Western nations for which trends are available are somewhat less likely than they were five years ago to agree that their country should impose tighter restrictions on immigration, as are publics in twelve other countries included in the 2002 poll. But concerns about levels of immigration have risen considerably in some parts of the world in the last five years. For example, in Jordan, where an influx of Iraqis since the start of the war led the government to tighten border regulations in 2006, the percent saying their country should restrict and control the entry of people more than it does now is up 22 points. In 2002 the Jordanian public was divided – 48% agreed that tighter restrictions were needed and 52% disagreed. Today seven-in-ten Jordanians want more border regulations and fewer than three-in-ten (29%) disagree. Support for increased border control is also up dramatically in Bangladesh (+25 points), Tanzania (+22 points), and Pakistan (+16 points). As noted in Chapter 1, opinions about immigration are closely linked to perceptions about threats to a country’s culture. In 46 of 47 countries, those who favor stricter immigration controls are also more likely to believe their way of life needs to be protected against foreign influence. In every region, this relationship is generally strong and consistent. In Western European nations, Canada, and the United States the pattern is especially clear – in each of these countries, the percentage of respondents who support protecting their way of life against foreign influence is at least 30 points higher among those who favor tighter immigration restrictions than among those who oppose such restrictions. The relationship between views on immigration and cultural threats is also strong in Israel and Lebanon, although elsewhere in the Middle East it is somewhat muted. This is due to the fact that concerns about foreign influence are high among both those who want more restrictions on immigration and those who do not. This is especially true in Egypt – the only country in the survey where there is no link between opinions about immigration and attitudes toward influence from abroad. Publics in Western Europe offer mixed opinions about immigration from the Middle East and North Africa and from East European countries. Of the six Western European publics polled, the Swedes are the most welcoming. More than six-in-ten in that country (63%) say immigration from Eastern Europe is a good thing and just slightly fewer (57%) express that opinion about immigration from the Middle East and North Africa. By contrast, Italian and German respondents offer overwhelmingly negative views of immigrants. Two-thirds of Italians say it is a bad thing that people from the Middle East and North Africa and from Eastern Europe come to live and work in their country. Germans express similarly negative opinions. Nearly six-in-ten (58%) say immigration from East European countries is a bad thing and an even larger share say the same about immigration from the Middle East and North Africa (64%). In France and Britain, majorities offer positive opinions about key immigrant groups, but the percentage of respondents in those countries who say immigration from the Middle East and Africa and from Eastern Europe is a good thing has dropped since last year. Following a slight increase in the proportion of the French public expressing positive views about immigrants in 2006, the French are now as likely as they were in 2005 to say immigration from the Middle East and North Africa and from East European countries is a good thing. Just over half of the French express positive views about key immigrant groups (53%) today. In 2006, nearly six-in-ten (58%) said immigration from the Middle East and North Africa and from Eastern Europe was a good thing. Positive opinions about immigration have been declining gradually among the British since 2005, and this is especially the case when it comes to views of immigrants from the Middle East and North Africa. Two years ago, 61% of British respondents said it was a good thing that people from the Middle East and North Africa came to live and work in their country. In 2006, slightly fewer than six-in-ten (57%) shared that view. Today, a narrow majority (51%) in Britain says immigration from the Middle East and North Africa is a good thing. Spanish respondents are the most divided when it comes to key immigrant groups. Virtually the same number says it is a good thing that people from the Middle East and North Africa (44%) and Eastern Europe (45%) come to live and work in their country as say it is a bad thing (45% say that about people from the Middle East and North Africa and 43% offer that opinion about people from East European countries). This is a sharp decline from just a year ago, when about six-in-ten in Spain viewed immigration from the Middle East and Africa (62%) and from Eastern Europe (60%) positively. Americans and Canadians continue to be generally more welcoming to newcomers than Europeans. As in 2005, solid majorities in both countries say it is a good thing that people from Asia and from Mexico and Latin America come to live and work in their countries. About six-in-ten Americans express positive views about Asian (61%) and Latin American (57%) immigrants. Canadians are even more welcoming – about seven-in-ten say immigration from Asia (71%) and from Latin America (72%) is a good thing. In the United States, views about immigration from Mexico and other Latin American countries are somewhat reflective of partisan differences. More than six-in-ten Democrats (61%) welcome immigrants from those countries, compared with a narrower majority of Republicans (53%). But when it comes to Asian immigrants, Democrats and Republicans offer nearly identical views. Fully 62% of Democrats and 59% of Republicans say it is a good thing that Asians come to live and work in the United States. Immigration has long been a topic of heated political debate in Israel. Most recently, a decision by the Israeli government to turn away refugees from Darfur entering the country illegally through the Egyptian border has drawn criticism from some in Israel who say their country has a duty to offer a safe haven to refugees because of its history. The poll finds that the Israeli public expresses overwhelmingly negative views about immigration from Africa. More than six-in-ten Israelis (63%) say it is a bad thing that people from African countries come to live and work in Israel and only about a quarter (26%) say immigration from Africa is a good thing. But Africans are not the only immigrants Israelis express reservations about – a narrow majority of Israelis also see immigration from Eastern Europe as a bad thing. Opinion about immigrants from East European countries is more positive than opinions about African immigrants, but fewer than four-in-ten Israelis (37%) say it is good that people from Eastern Europe come to live and work in their country. Slightly more than half of Israelis (52%) say it is a bad thing. Majorities in 32 of the 36 countries where respondents were asked about the main reason people leave their country to live elsewhere, including overwhelming majorities in every Latin American, East European, and African country surveyed, say people emigrate in pursuit of job opportunities. But considerable minorities in parts of Asia, Africa and the Middle East also cite education and nearly three-in-ten (28%) in Lebanon say safety is the main reason people leave their country to live elsewhere. 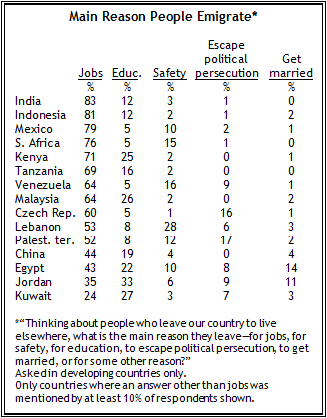 In Kuwait, the only country where more people say something other than jobs is the main reason people leave their country, more than a quarter (27%) say people leave to get an education elsewhere. Education is also mentioned by a considerable minority in Jordan (33%), Malaysia (26%), Kenya (25%), Egypt (22%) and China (19%). Lebanese respondents are the most likely to say safety is the main reason people leave their country. Nearly three-in-ten (28%) in Lebanon offer that opinion. Christians and Sunni Muslims in Lebanon are considerably more likely than Shia Muslims to say people leave mainly for safety reasons. Close to four-in-ten (37%) Lebanese Christians and three-in-ten Lebanese Sunnis say that is the case, compared with just 17% of Lebanese Shia. Each year, migrant workers send more than $230 billion to their families in their home countries, according to the World Bank. The Pew Global Attitudes survey finds that more than one-in-five respondents in 11 of the 36 developing countries polled, including nearly half in Lebanon (47%) and Bangladesh (45%), say they receive money from relatives living in another country. This is especially common in Africa, where sizable minorities in Mali (42%), Nigeria (38%), Senegal (37%), Ethiopia (35%), Ghana (33%) and Ivory Coast (27%) say they receive money from relatives living abroad at least occasionally. Among Latin Americans, Mexicans are the most likely to say they receive money from relatives living abroad. About a quarter (23%) of Mexicans say that is that case. In the Middle East, more in Lebanon (47%) and Egypt (30%) than in any other country say they receive remittances from family members. And in Asia, Bangladesh (45%) and Pakistan (27%) are the only countries where sizable minorities receive money from relatives living in other countries.